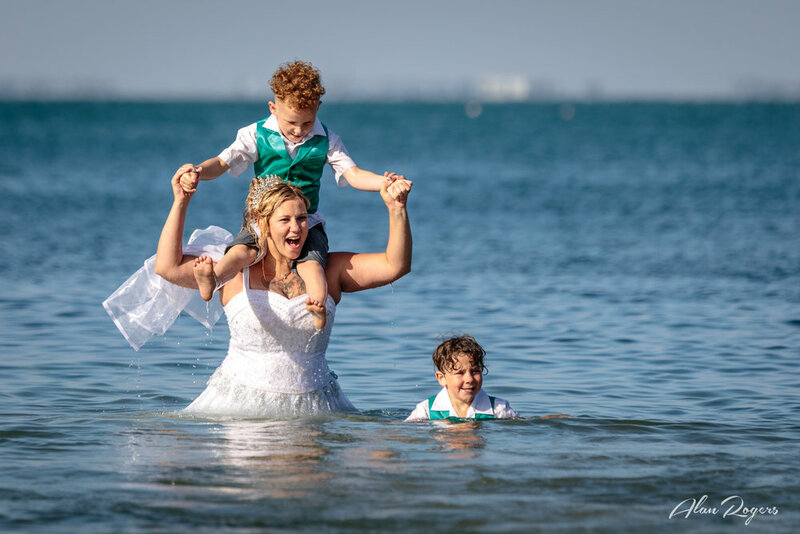 'Wedding Photojournalism' is a modern and exciting style of Wedding Photography that documents & captures all the emotion, fun, beautiful & awesome moments at weddings. The images reveal the true story, heart & soul of your wedding! Cooling Off - Main Beach, Geelong, Australia. A Little bit Bored - Sandringham, Australia. Father Handing Over the Bride - Marybrooke Manor, Sherbrooke, Dandenongs, Australia. 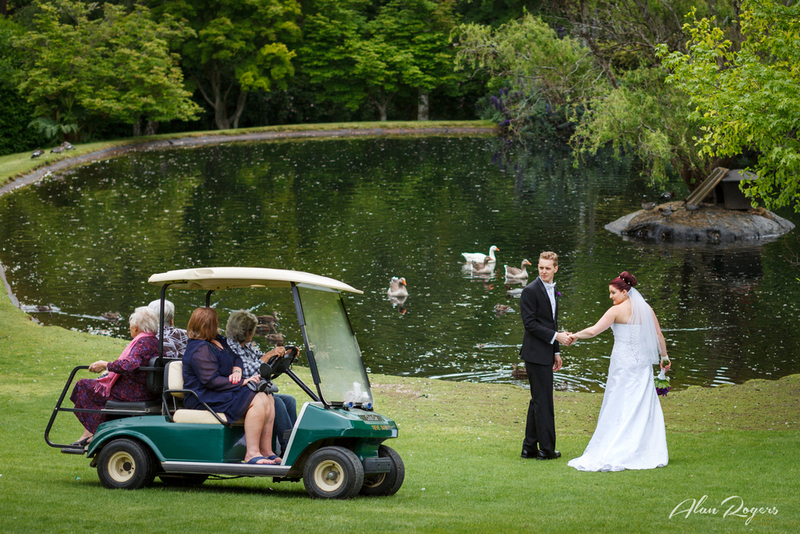 Hat for the Bride - Pipers by the Lake, Ballarat, Australia. Dad Helping Out - Elizabethan Lodge, Blackburn, Australia. Moonlit Wedding Cake - Sandringham, Australia. The majority of Wedding Photojournalistic imagery does not involve setup poses - e.g. bridal parties jumping in the air, awkward positions, fake smiles, mock cake cuttings etc. Instead the images are far more interesting because they are 100% genuine and real. Mothers joining hands, two families united. Grandparents zipping past the Newlyweds. Bride and Groom cooling off under the water sprinkler. A Mothers tears of joy as she sees her daughter. Note, we still take some family, group & bridal photos. We just don't spend too much time on them. This approach gives you more time with family & guests! Your wedding will be filled with fun and excitement, drama, suspense and genuine love. It is truly one of the most epic days of your life! My style of Wedding Photojournalism allows you more freedom and time for you to really enjoy your day because my team & I do not take over and start bossing you and your bridal party around. I promise not to drag you away from your guests for a lengthy and over the top photo shoot, only to have everyone becoming 'over it all'. 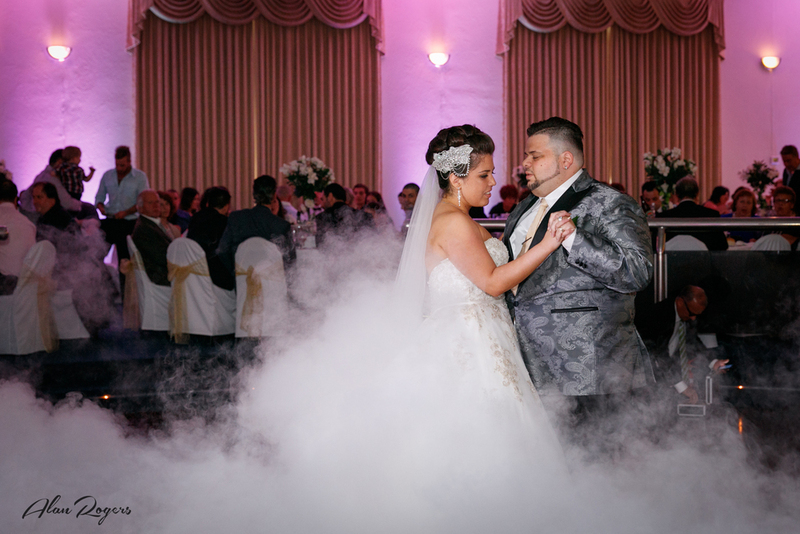 A beautiful and misty First Dance. An overwhelmed Groom. Emotions flow just before his Bride arrives. With so much happening at weddings, I always aim to capture things going on that Brides & Grooms were never privy to. After the wedding they are always surprised and glad to have recorded what their family, friends and suppliers were up to during the wedding. Father takes a sneak peek. A long day for a little Flower Girl. The cakes arrives just in time, through the backdoor. A Father watches as his daughter and new husband leave in a taxi. NO Filters or Special Effects! Original image - Captured and left very natural and as close as possible to how it was. Same image, altered examples - NOT 'Wedding Photojournalism'. A gorgeous day in the Dandenong Ranges - Melbourne, Australia. Filter called 'Yesteryear'. Yellowish & faded effect - yuck! A weird angle applied just for the sake of it? - silly. Filter often referred to as 'Vintage'. Looks washed out. Filter called 'Antique Sepia'. Brownish old look - boring. 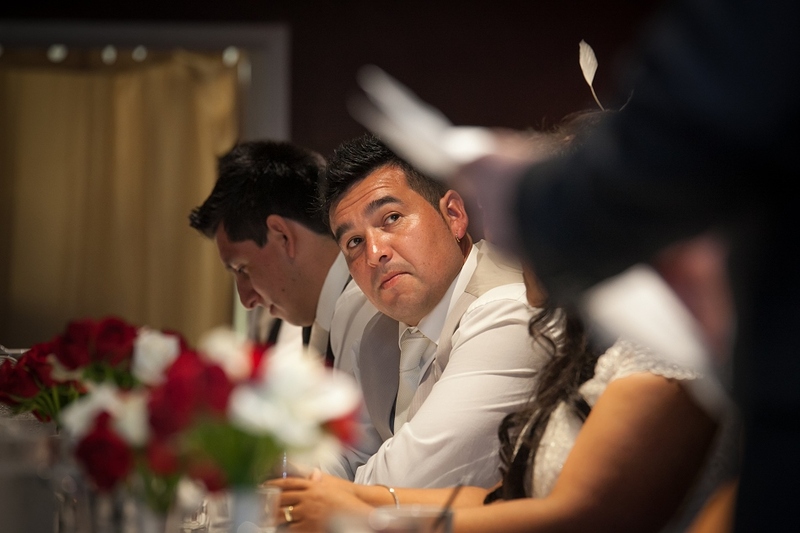 When you listen carefully to speeches at weddings they are very genuine, and I am always looking to capture raw emotions. It is a time for Mothers, Fathers, Brothers, Sisters, other family members and close friends to express publicly their true inner feelings and best wishes. When the speeches start all the commotion slows down, and attention is focused on the true reasons for having the wedding. Speeches can certainly be very funny and entertaining too, especially when the Best Man has the floor. Bride making last minute changes to her speech. The Groom looking up as his Father talks. Whilst this can be a debatable topic, to have or not have Children at weddings, I find it hard to imagine one without at least some children, especially those closest to the Bride and Groom. Children's enthusiasm is boundless and they totally adore everything the Bride and Groom does. They get the opportunity to dress up, and at weddings always look great thanks to their parents who do a wonderful job. Children on the day can be fun, warm and endearing, and I seek to capture them in as many moments as possible. During the entire wedding day I also keep an eye open to photograph detail shots of dresses, rings, shoes and more. All of these details are really important and I am keen to record them. I also look for other inconspicuous items that perhaps you may never think of much on the day, but in years to come they will mean so much. Click here to see some more examples of detail images I have captured. Tying up the wedding dress. Even though technically speaking the style of 'Wedding Photojournalism' does not include formerly posed imagery, however, there will of course be times in all weddings where Mums, Dads and Grandparents would like some family group shots and bridal portraits. So for most weddings I happily allocate some time for portraits and family photos as required. Such images in themselves form an important part of the overall documnetary record for the wedding. 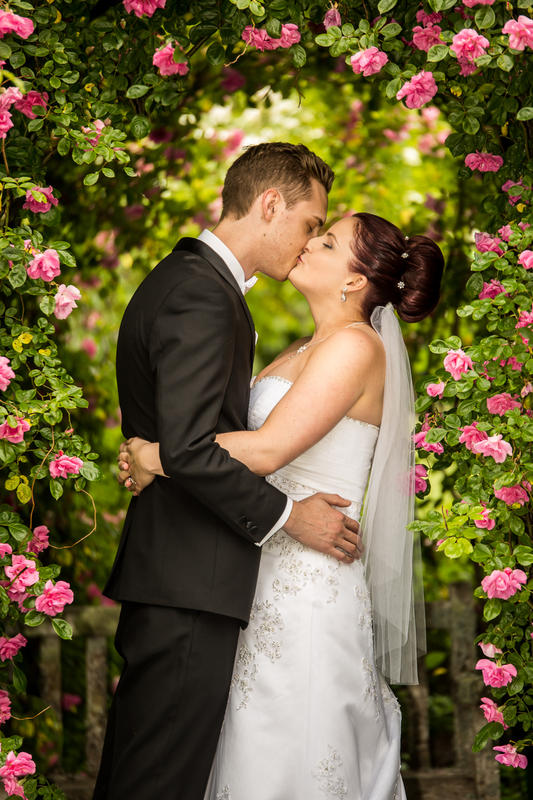 Bride and Groom under the roses. Sunset - Skyhigh, Mt Dandenong. Bridal Party just having fun. ..."We engaged Alan Rogers Photography for a winter wedding after a long search for the right photographer. Our experience was first rate from the initial meeting, preparation for our wedding day and the production of the digital and bound albums. We felt completely at ease and in assured hands, especially given some of the challenges of photographing a wedding during winter. Alan produced an absolutely stunning recollection of our wedding day and was a sheer delight to deal with. Great on the day and really did produce everything we could have ever wanted in terms of the breadth, depth, look and feel of the photos. An outstanding experience. Thank you - best wishes from Stuart and Kathryn, Melbourne. Melbourne, Australia. - Over 40 years experience! - WPJA Accredited Wedding Photographer. STUDIO (by appointment) 10 Elvie St, Doncaster East, Melbourne, Victoria, AUSTRALIA, 3109.